As the long, hot summer drags on, we here at The Triangle figured we’d provide a steady stream of NFL goodness as a reminder of the light at the end of the baseball-lined tunnel. As guys like this have started to both exist and play professional football, there’s been a shift in how teams have tried to stop them. Because when this is happening, it doesn’t matter how fast a 5-foot-8 cornerback is. 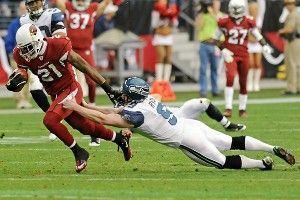 That was the thought behind all the excitement about Patrick Peterson. At 6-foot-1, 220, the guy was built more like a running back than a quarterback. And, oh yeah, he runs the 40 in 4.35. Like any cover corner in his rookie year, Peterson’s 2011 on defense had its share of follies for all its bright moments. As a corner, the game that sticks out is the Week 13 matchup against the Cowboys and Dez Bryant. That’s where the first bit of this clip — Peterson informing nondescript assistant coach that he’s going to be the best corner in the league — is taken from, and I have to say, it’s pretty awesome. The thing about Peterson’s time as a corner last year is that no one talked about it because we were too busy watching him do Devin Hester things all over people. There are plenty of those in this clip as well, including Peterson fielding a punt at the 2-yard line and bringing it all the way back for an overtime win. There are only so many guys who should be expected to take it to the house every time they touch it. None of them should weigh 220 pounds. Patrick Peterson is the future human.